Many automotive interiors are finished with leather, vinyl, wood, carpet, fabric, metal and plastic surfaces. BLACKFIRE Interior Cleaner will safely and effectively clean all of these surfaces, replacing a whole shelf full of cleaners. It is a true� 100% water-based, multi-material cleaner. It contains no acids, no butyl of any kind, and no petroleum distillates. 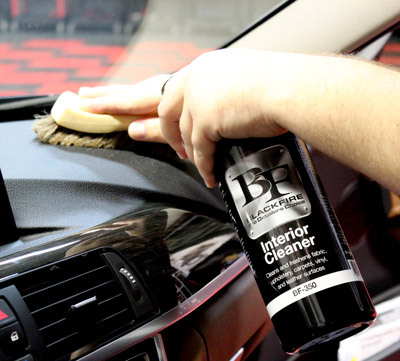 If a material can be cleaned with water, it can be cleaned with BLACKFIRE Interior Cleaner. It's even safe as a hand cleaner.